By default WordPress comment box allows visitors to use some basic HTML tags in their comments. However, most bloggers are unaware of this and most users don’t know how to write HTML. If you have or want to have specific formatting for your comments, then you can really benefit from this article. In this article, we will show you how to add quicktags in WordPress comment forms which will allow you to better style each comment element while giving your users bunch of quick tags to work with. You are probably wondering what are quicktags? 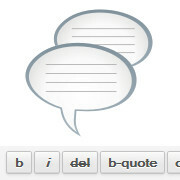 Quicktags are buttons that you can offer users to easily style their comments. For example a simple button to bold highlighted text is a quicktag. When you see a toolbar that has the option to bold, italicize, add headings, etc, those are all quicktags. Now that you know what are quicktags, let’s take a look at how you can add these in your comment form. First thing you need to do is install and activate the Basic Comment Quicktags plugin. Once activated, you need to visit Settings » Discussion page and check the box next to quicktags option. Click on the save changes button to store your settings. You can now visit a single post on your website and scroll down to the comments form. You will see a basic formatting toolbar above the comment text area. 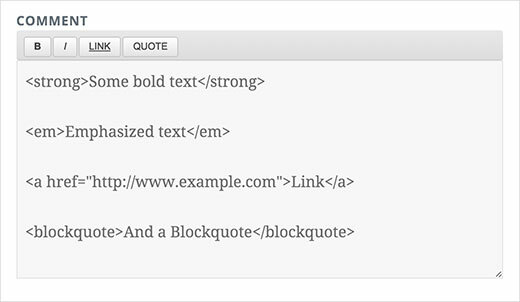 We hope this article helped you add basic quicktags for HTML formatting in comments form. You may also want to see our guide on how to style WordPress comment form. I can see some quick tags being useful, others not so. I guess it depends on the type of forum you are trying to promote. I can certainly see how a link could be useful on many tech / web blogs, but general styling (bold, italics, headings, etc) not so sure about. Having said that, it hasn’t stopped me installing this plugin on my own site!